Sooo... did the last week disappear into a time vortex? I vividly remember planning to do this mani last Wednesday night, when my new MoYou plates arrived. Then all of a sudden it was Monday morning and I realised I'd done a bucketload of things, including many sets of nails, but not this one that I'd been planning. First up, here's a swatch of Delush Polish Master of Disguise which I got recently in a Femme Fatale sale. I bought this partly because it was on sale and partly because I recently decided I need more browns. I'm not in love with it, but I do like it enough to give it another shot. I only used two coats for this swatch and the jelly is a little patchy - hopefully three coats will be the charm. Didn't make the connection? That's OK, I feel like my link is somewhat tenuous anyway. My book inspiration is A Confederacy of Dunces, an utterly brilliant and odd tragicomic story of 30 year old Ignatius J. Reilly, a highly opinionated and extremely eccentric slob. Ignatius does love his food, so when he takes a job working as a hot dog vendor (dressed as a pirate, no less) he eats more hot dogs than he sells. What do you know, I just got my new MoYou plates, including Cookbook 05 featuring hot dogs and fast food - it was meant to be! Except for the whole forgetting to do this last week part. 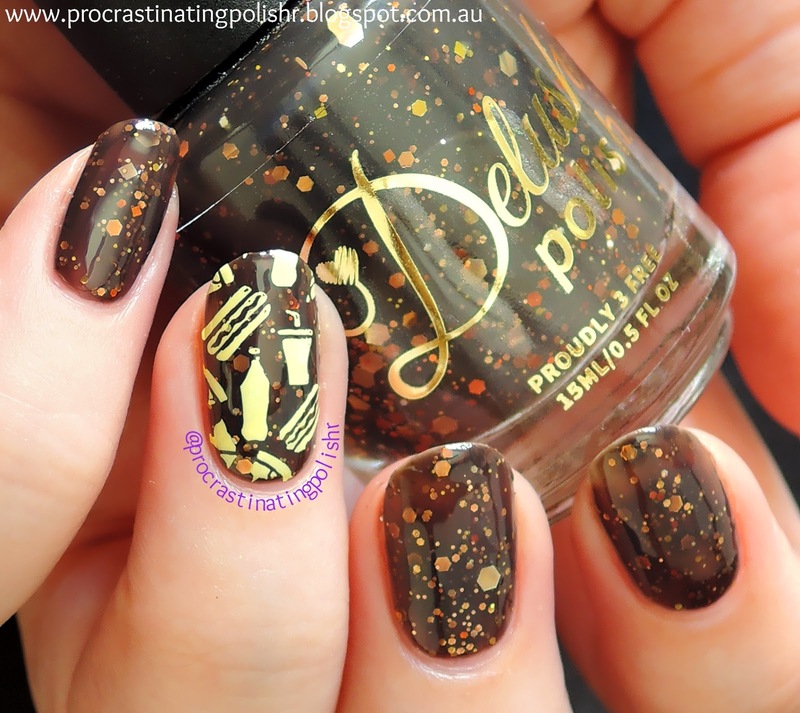 Before I go, can we take a moment to admire that perfect yellow stamping polish from Nail Stamping Queen? Completely opaque over brown! Colour me impressed. This polish is lovely. Perfect on you. Thanks Alinta! I really like browns but never seem to buy them.